What is a Urine Protein Test? The kidneys are fist-sized organs located in the middle of your back below the rib cage, and have a number of vital responsibilities in keeping your body healthy and running properly. Waste in the blood comes from normal breakdown of muscle and from food you eat. Once your body uses what it can from food you consume, what is left becomes waste that is filtered by the kidneys. 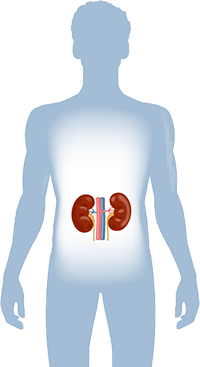 The kidneys process the waste into a state that can then be safely moved into the urinary system and eventually excreted from the body. In acting as the body’s filter, the kidneys filter out important chemicals needed for normal functioning, and release them back into the blood for the body to use. Because of this, the kidneys are also responsible for regulating the body’s level of these critical substances. Because they filter the blood the kidneys need continuous pressure. When blood pressure drops too low, the kidneys can produce chemicals and proteins that help restore normal blood pressure so they can continue doing their job. If the kidneys aren’t getting enough oxygen, they release a hormone that stimulates the bone marrow to produce more oxygen-carrying red blood cells. For more information contact the GW Ron and Paul Kidney Center by calling 202-715-4330. The Division of Kidney Disease and Hypertension and the Department of Urology at The GW Medical Faculty Associates are pleased to announce the creation of a comprehensive, multidisciplinary clinic to care for patients with kidney stones. The physicians and health care professionals in The GW Medical Faculty Associates Division of Endocrinology & Metabolism excel at providing comprehensive evaluation, diagnosis, treatment and management of endocrine disorders. These include diabetes, thyroid diseases, bone and mineral disorders, adrenal and pituitary diseases, endocrine tumors and reproductive disorders.